One of the really fun things about getting my name out there through my novels is hearing from readers. And quite possibly the best reader connection so far has been with my cousin Cathy. Turns out our great (or is it great great?) 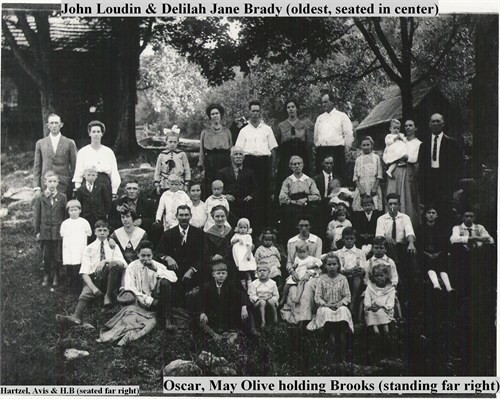 Grandpas Oscar and Sylvester Loudin were brothers. Cathy sent me the above photo which I had never seen before–family back in the day. BEST of all, my great, great, great-grandmother is in this photo. That would be Delilah Jane Brady–the namesake for the heroine in Appalachian Serenade. I love getting character names from my family tree and Cathy introduced me to several great options: Hartzel, Avis, Claudis, and Oid.Dad still tells stories about Oid Loudin. I’m think I’m going to need to hear those again next time we talk. Wow! What a treasure! Does she know where it was taken? She didn’t say, but I’ll ask. Remind me to tell you my Oid story! And those, umm, new names are rather interesting. I’ve never heard of the name ‘Oid.’.